A reliable source for Automotive Parts Washers information and a resource for accessing leading Automotive Parts Washers and suppliers. Automotive parts washers are machines used to clean newly manufactured and used automobile parts. Grease, dirt and contaminating oils accumulate on parts’ surfaces as a result of the manufacturing process or road use. Just like other types of industrial parts, unfinished automotive parts must be cleansed of contaminants before they can undergo surface finishing or assembly; contaminated parts pose a hazard to equipment functionality and safety. Automotive parts washers are necessary because normally operating vehicle engines become dirty after years of operation; spent oils require replacement, poor-quality fuel can cause build-up in engines and other products of combustion build up on engine components over time. In addition to this build-up, vehicle engine components are exposed to a wide variety of contaminants while on the road, and these can contribute to energy inefficiency and degradation of function. Automotive Parts Washers Automotive parts washers are machines used to clean newly manufactured and used automobile parts. Grease, dirt and contaminating oils accumulate on parts' surfaces as a result of the manufacturing process or road use. Automotive parts washers provide a venue for the safe and effective cleaning of dirty automotive components. Some industrial parts washer manufacturers fabricate washers designed specifically to handle automotive parts washing, making the cleansing of small engines, transmissions, pneumatic parts, hydraulic parts and small parts much easier and more effective. Many automotive parts can be washed by standard parts washers, but some parts cleaners are tailored specifically to serve the automotive industry. 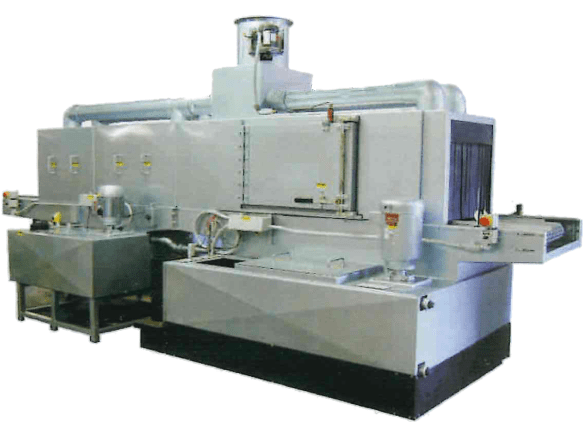 Aqueous hot water solutions are generally used in automotive parts washers as well as ultrasonic cleaning tubs for fast precision cleaning. Automotive parts washers for auto repair shops are generally cabinet or tub spray washers, which use organic biodegradable solvents. Part washers for transmissions, engines and farm equipment parts in particular are usually more specialized; ultrasonic washers are used on complex parts that require a high level of surface purity. In an ultrasonic parts cleaner, tiny air blasts burst against parts' surfaces, cleaning in crevices that other washing techniques cannot reach. Automotive industrial washers often use ultrasonic cleaning to reduce the risk of malfunction due to part contamination. The automotive industry concerns itself with the precision with which all of the constituent parts of an automobile are manufactured; the failure of even one part can be catastrophic in terms of engine performance, and in extreme cases, in terms of driver safety.